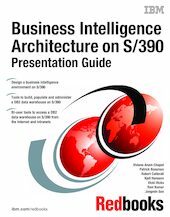 This IBM Redbooks publication presents a comprehensive overview of the building blocks of a business intelligence infrastructure on S/390. It describes how to architect and configure a S/390 data warehouse, and explains the issues behind separating the data warehouse from or integrating it with your operational environment. This book also discusses physical database design issues to help you achieve high performance in query processing. It shows you how to design and optimize the extract/transformation/load (ETL) processes that populate and refresh data in the warehouse. Tools and techniques for simple, flexible, and efficient development, maintenance, and administration of your data warehouse are described. The book includes an overview of the interfaces and middleware services needed to connect end users, including Web users, to the data warehouse. It also describes a number of end-user BI tools that interoperate with S/390, including query and reporting tools, OLAP tools, tools for data mining, and complete packaged application solutions. A discussion of workload management issues, including the capability of the OS/390 Workload Manager to respond to complex business requirements, is included. Data warehouse workload trends are described, along with an explanation of the scalability factors of the S/390 that make it an ideal platform on which to build your business intelligence applications.